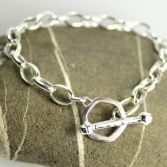 Our Chunky Hexagon T-Bar bracelet, made from 2.0 mm square sterling silver wire forms our signature T-Bar Clasp which has been handcrafted and finished by me. 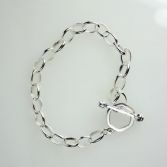 The unique clasp hangs on a solid sterling silver chunky belcher chain with links measuring 3.20 mm by 4.30 mm. 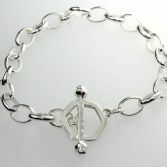 The bracelet is available in 3 sizes please use the drop down options below. The Chunky Hexagon T- Bar bracelet looks great worn as a single piece or can be layered with others to create an individual look, looks great on guys or girls. If you would like a blue black oxidised finish use options below to select this. 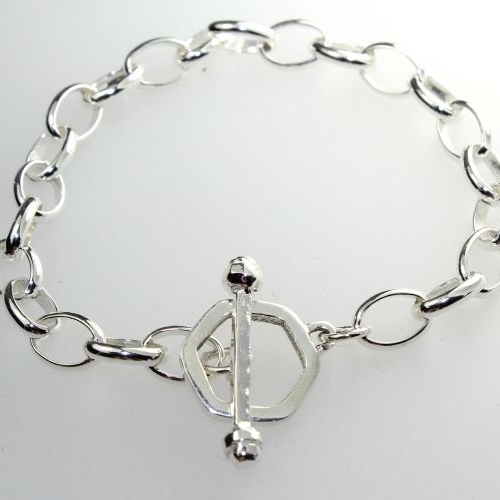 Your Chunky Hexagon Bracelet is made from high quality sterling silver and has full UK hallmarks stamped at the Edinburgh Assay Office. 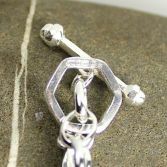 Whether buying for yourself or as a present your Chunky Hexagon T-bar bracelet will be presented in one of our signature gift boxes and posted via Royal Mail special delivery (signed for) to any UK address free of charge.